It's been a long time coming, but I am about to start laying down tracks for my new album starting this weekend at Dugger Mountain Music Studios in Piedmont, AL. I'm very excited to finally be recording songs that I have been performing for a while in the time since The Homeplace was released. More details to come! I am excited to announce that I will be interviewed this Friday, July 25 from 12-1pm for the new radio show by Jonathan Moses called Rising Stars. Rising Stars is a weekly Radio Show in Anniston and Oxford on WFZX "The Fox", showcasing the best local talent, Singers/songwriters, Bands and more. People can tune in and hear the Program on 99.1 FM in Oxford, or 104.3 FM in Anniston. And the station can be heard online atwww.jeffbeckmedia.com, just click on the WFZX "The Fox" logo, and on Cell Phones with Apps on the Tune In App, it will come up under WFZX 1490. And also at http://tunein.com/radio/The-Fox-1490-s27118/. Please tune in today at noon and show me some love! ♥ I am hoping to obtain a copy of the show, and if I can, will put an archive up. I created a website dedicated to folk music, dance, and art called Folk Renaissance. I also obtained a radio spot on Sunday nights from 9-11pm on 91.9FM WLJS through Jacksonville, Alabama called The Folk Renaissance Radio Show. You can listen by live stream and I am working on getting archives of older recorded shows up if you cannot listen live. Check out the site and let me know what you think! You can comment on the site or write me at admin@folkrenaissance.com. I appeared on Kelli's Acoustic Crossroads, a local TV show out of Gadsden, Alabama last April, and below is a video of the show. Kelli was an awesome host and interviewer, and I enjoyed myself thoroughly! 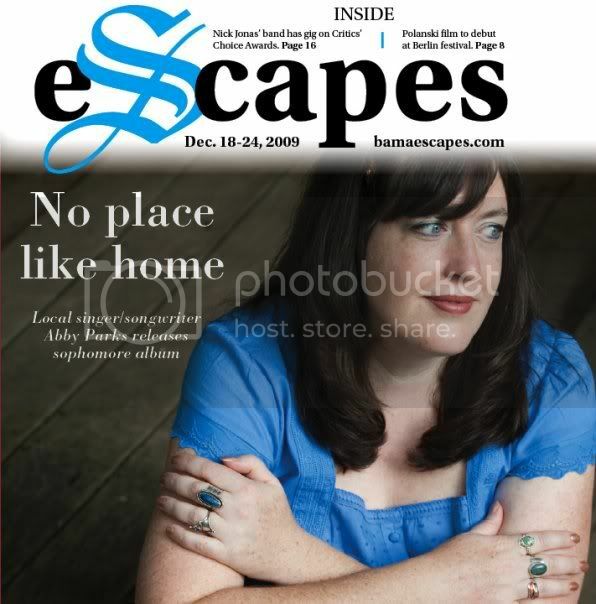 A six page article was written about me and my new album The Homeplace in Songwriter's Monthly this past January, 2010. I was interviewed about my songwriting technique, inspiration, the technical production of the album in studio, and there is much more, so please check this wonderful article out! WomensRadio Independent Channel on Live365 will be airing "Lambert Road" in their regular playlist two times a day until it is updated on March 1st. Their playlist is ordered alphabetically by the artist's first name so you can approximate when my song will air. There are many other great female aritists as well on this great station so tune in and enjoy! My song "The Homeplace" will debut this week on 'New Music Thursday' on the Bud and Nancy Show at Web Radio Puget Sound. It will air several times during the day from 6am-4pm/Pacific and again on Thursdays for a few weeks. It will join other WRPS artists on their 24/7 on-demand stream as well. Also, all eleven of my songs have been requested/played on Whole Wheat Radio in Talkeetna, Alaska. If you follow the link you can actually open a free account with this station and place requests. If you have the time, please do so and request any of my songs that you would like to hear played. I am pleased to announce the release date for my upcoming CD THE HOMEPLACE will be September 29. Along with the release, I will be having a CD release party at MoonSongMusic Cafe in Gadsden, AL starting at 7 pm. There will be new CD's for sale there as well as great food and a live performance of songs from my new album. Please tell all your friends about this important event and come out to help me celebrate! I will be working on my new album this summer with producer Doug Jansen Smith of Soundcell Studios in Huntsville, Alabama. He discovered acts such as Take Six and Bryan McKnight and helped them get recording contracts with major labels. He also has worked with artists such as Vanessa Williams, Alicia Keys, Kenny Rogers, Bonnie Raitt, and Phil Collins. I met with him recently and we discussed the direction my project will take, and I have to say that I am so excited about how things are shaping up. I was very impressed with Doug and I know this is going to be a one-of-a-kind experience, recording with such a seasoned and talented producer. This is a big turning point in my career and I look forward to what will come about! I was interviewed by Coleman Lipsey of the show Tapestry, a cultural arts radio show on 90.3 FM WBHM Birmingham. The show aired June 19. I thoroughly enjoyed the experience. Coleman was an exceptional interviewer and Michael Krall did a great job putting the show together. Generally, I am more a listener than a talker, so it was fun (as well as a bit nerve-wracking) to spend much time talking all about MYSELF! Ha. The interview, of course, was edited to the extreme (from 45 min. to 5 min.!) and woven throughout my song "It's Not Over." The link below will take you to the site, so check it out! I've been cast to play the part of Golde, wife of Tevye, in the JSU production of FIDDLER ON THE ROOF in Jacksonville, AL. It will be performed in late February of 2008. I'm not sure of the exact dates yet, but will post them when I know. I'm excited for this opportunity to return to musical theater. Past musicals I've been in include OKLAHOMA, THE FANTASTIKS, LITTLE SHOP OF HORRORS, and (who would have guessed?) FIDDLER ON THE ROOF! I admit that I have a much better part this time, so can no longer feel jaded about this particular show. Ha! Please come out and see us in action! In the beginning of August I took a songwriter tour in Nashville with Marc-Alan Barnette, a prominent songwriter who has been in the Nashville scene for 20+ years. It was a fun, entertaining, and informative experience. I was given a personal tour of music row, met contacts from publishing companies, NSAI headquarters, recording studios, and chatted with several Nashville hit songwriters. Marc was friendly, hilarious, and very knowledgable about the industry. I got hands-on experience in how to write a song that would be marketable in Nashville by actually co-writing two songs with Marc himself. We then took one of them over to his favorite recording studio and did a working demo. I learned my way around downtown Nashville pretty well and strolled up and down streets lined with music venues showcasing various country bands. The music was inspiring, the food was great, the company was enjoyable, and I left Music City feeling like I'd had the time of my life. If you are a songwriter looking to break into the Nashville scene, I'd definitely recommend this tour, as it lets you into secrets of the industry that Marc-Alan spent years to learn himself. I feel fortunate to have had such an eye-opening glimpse into what is an exciting but difficult industry. I will be appearing on the Channel 24 TV morning show in Jacksonville Monday, March 27 at 7:30 am to plug the upcoming concert at Zannie Theater, and then again on Monday, April 3 at 6:30 am for a live performance. Set your VCR's--it should be a blast! The magazine Steal Frame is hosting an acoustic music event at Fort McClellan for ten musical acts to perform at. I was just accepted as act #6 today. It will tentatively take place Saturday, March 25. I will reveal details as they unfold. For all you songwriters out there, there is a new chapter of the NSAI that meets in Birmingham, AL once a month at the Moonlight Music Cafe (now meetings are held at Java and Jams, also in Birmingham). The next meeting will be Monday, March 13 at 6:00 p.m. There is a link through the Moonlight's website on the calendar page that can get you through to info about NSAI. I've attended two meetings thus far. A songwriter/"expert" gives a lecture on songwriting or a talk with Q&A, and then songwriters can bring a song on CD, play live, or just bring a lyric sheet and have it critiqued by the expert and the group (they require you bring 20 copies of your lyrics so attendees can read them as they listen). It is a nice, laid-back setting to share in, and everyone is friendly and tactful with comments so far. It's good exposure for closet songwriters as well as those who heartily subscribe to shameless self-promotion. This is a great opportunity for anyone in this neck of the woods who is looking to break into a songwriting community and still have some access to Nashville without actually living there. In fact, the speakers last week made the comment that some songwriters prefer to be outside of Nashville just for the competition factor and the pressure to conform to industry standards that can have the adverse affect of choking individual creativity. Yet being a member of NSAI gives you all kinds of channels to network and market your songs to that very city, as well as elsewhere. But you don't even have to join to take part in the meetings here in B'ham and have your songs critiqued, which is nice for those with a tight budget (the $150 yearly fee for membership in NSAI may not be easy to come by for starving artists). So come on out and join us for some fun and bring a song with you. If you don't know anyone else, just seek me out. I'm the one with the infectious laugh that will either cause you to laugh with me or make you run the other way! Well, the CD's are finally in as of last week and available for purchase. CD Baby is still working on getting them onto their site, but they are available through me as well. Just go to the Contact Info page and email me with your request. The release of my first album, Moving On, will take place in mid-October. I'm really psyched! CD's will be available through CDBaby, as well as Amazon, and others once I get the ball rolling. Email me for an early copy.